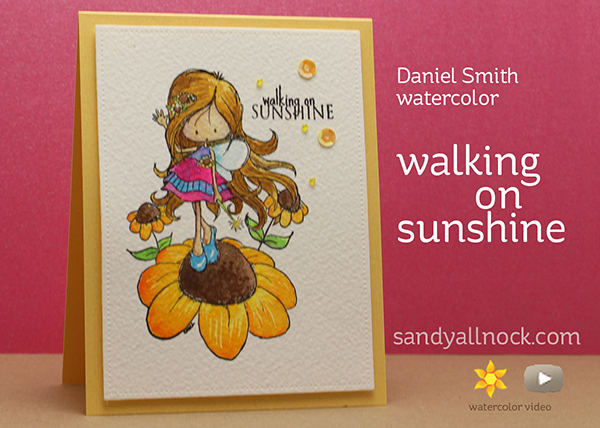 Earlier this year I shopped Tiddly Inks’ big sale – and this Fairy Sunny Day image just screamed out to be colored by me – with lots of yellow, right? 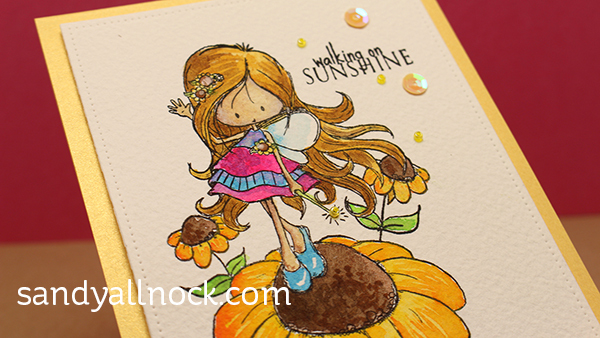 Lots of you have been asking for more watercolored images…so I decided to jump in with this little bit of sunshine on a Monday morning. Hope she makes your day go just a bit better! Watch the video below or click HERE to see it in HD on YouTube. As mentioned yesterday, I’ve been trying to figure out what “my” watercolor palette would be. If wishes were fishes but I didn’t have more than 33 colors to choose from. UGH! It’s like picking between children, ya know? So I bought THIS palette and decided to see what would happen if I just used one set of colors for a while. What would I miss? What wouldn’t I use at all? Like with Copics, it takes me a long time to figure that out – but maybe someday I can come up with a color list to share that’ll be of some help, eh? In the meantime, here’s yesterday’s video (in case ya missed it!) showing how I created the palette. Hi Sandy! You make everything look so easy to do. I LOVE your work. You inspire me! Thank You! Thanks for all the tips you gave us in your video both verbally and just by doing. It was very inspiring. Thank You So much Sandy, you DID make my day with this. I don’t shop online (I KNOW! I am old-ISH! ) LOL, but yesterday I thought to check the art supply store where my daughter went to University (NSCAD). I bought water color pencils there at that time. I was trying to locate Peerless WC but I did find Daniel Smith’s WC’s and I might just have to spend the extra and do that. After seeing this, I just might. Love your work and your tutorials as they are so helpful. Thanks again for doing this! I truly appreciate it! Christy’s images are always so much fun. Great job on this one Sandy! Thanks.